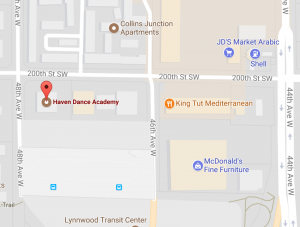 Contact Us - Haven Dance Academy - Ballet, Tap, Jazz, Modern & Hip Hop Dance Classes for toddlers to adults! If you have any questions or would like more information, the most efficient way to reach us is by filling out the form below or via email. If you would like to speak with someone in person, feel free to call or stop in during our front desk hours. We are also available by appointment if needed as well. We look forward to helping you!